"I Can't… I Have Rehearsal!" I had a shirt with this saying printed on the front when I was in High School…and it was definitely a saying I was all too familiar with at the time. The life of a theater kid (or adult for that matter) consists of rehearsal after rehearsal after rehearsal! And don’t get me wrong -they love it! – and here’s the proof. 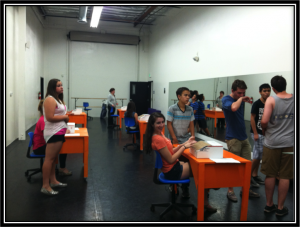 This past Memorial Day weekend, some of the Show Biz Kids Ensemble students from The Music Room were “lucky” enough to have a rehearsal for our upcoming production of How to Succeed in Business Without Really Trying. I was so jazzed to come to rehearsal on Monday morning (at 930am!) and find that every student was on time to, awake (for the most part) and ready to rehearse! I am always excited to see the passion and drive for performing still alive in kids! Most of these kids could have been at the beach or a BBQ or just relaxing at home on their day off. 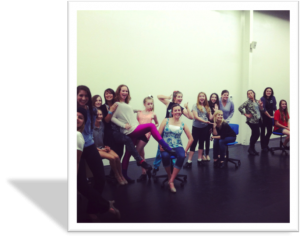 But instead, they were practicing and learning and working hard, together as an ensemble, to make their show fantastic! I know most SBK Ensemble members consider TMR to be a second family of sorts. So although, they may have had to say, “I can’t, I have rehearsal” so some of their other friends and family, at the end of the day, they were able to spend quality time with friends and family who share their passion for theater and performing! So proud of these kids and their hard work!! !